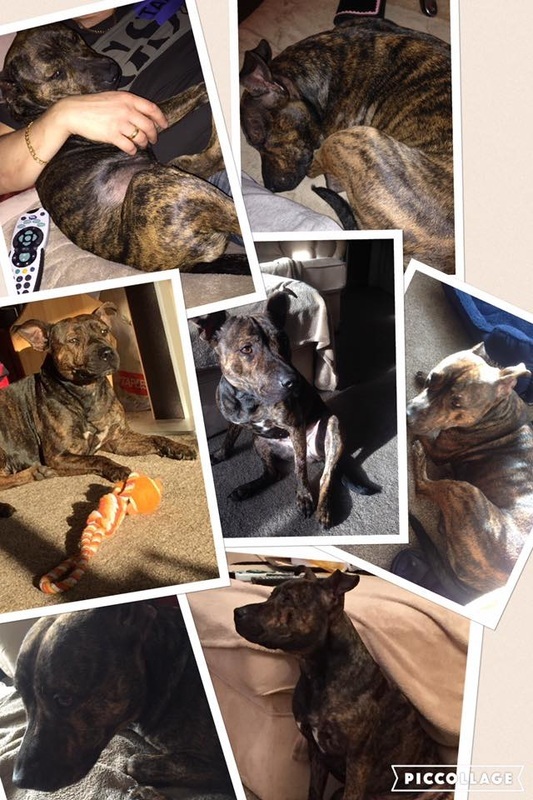 Lola is a staffie X who is 2 years old. She had a rough start in life and unfortunately the person who saved her from that then had a change of working shifts so Lola was left on her own for long periods of time. As a result she became frustrated and chewed her way out several times, so BABS have taken her in to find her a decent home. "Lola really is a sweet heart would love nothing more than a family. We went out over the fields today with the kids she was on the long line wouldn't leave my daughter's side absolutely loves children. Out on walks she can't get away from other dogs quick enough she really is timed." Lola could live with a submissive, non-reactive male dog for company - or with people who would be with her nearly all the time. Definitely no cats! 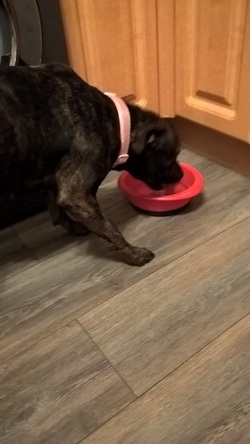 "Lola has just been on her jollies for 5 days and she has been really well behaved, playing nicely with the kids. Lola is a sweet girl who just wants to please. When she first arrived in foster she was such a timid girl. She has come on leaps and bounds, her confidence building and she is now a healthy weight. Lola is crate trained although is now spending time out of the crate which is working well. She sleeps in her bed overnight with us which is very good. She is house trained but sometimes can have a little accident when excited. 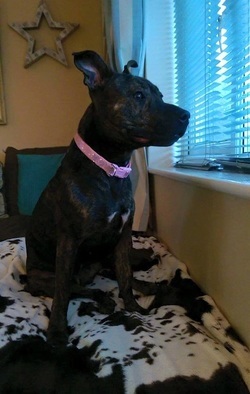 Lola now need someone to spend some more time with her to associate with other dogs, she has played with the neighbours dog, but she needs to spend time with other dogs. She loves a cuddle and sometimes you can't tell she is even there when i have worked from home as she just curls up on the sofa or next to you. Typical of chasing cats/birds, has been spending time with a rabbit and has got better in not chasing it around the garden. Lola will benefit from a loving home and someone who can spend time with her. She can stay alone up to 2hrs uncrated and 4hrs crated. Lovely little girl"
We are looking for a new fosterer for Lola due to her current foster mum having a change in situation. If you can help with a foster home please contact us using the fostering link from our main page. If you are interested in adopting Lola please contact us . Homecheck and adoption fee apply.